This is one of my very favorite House Mouse stamps and I'm sure I use it every year to celebrate April showers. How could I resist those tiny Mousies splashing their way through the rain puddles? I colored with a combination of polychromos pencils and ProMarkers, with white gel pen for the raindrops. I used one of my straight border dies (Spellbinders) to cut each edge of the image and then matted it with a royal blue CS frame. The background was originally a card front which I 'rescued' from the trash bin because I loved the glittery embossing, and I trimmed the edges by hand. I added both ribbon and heavy twine but left it very simple after that. I wanted it to stay CAS and to work as either feminine or masculine. 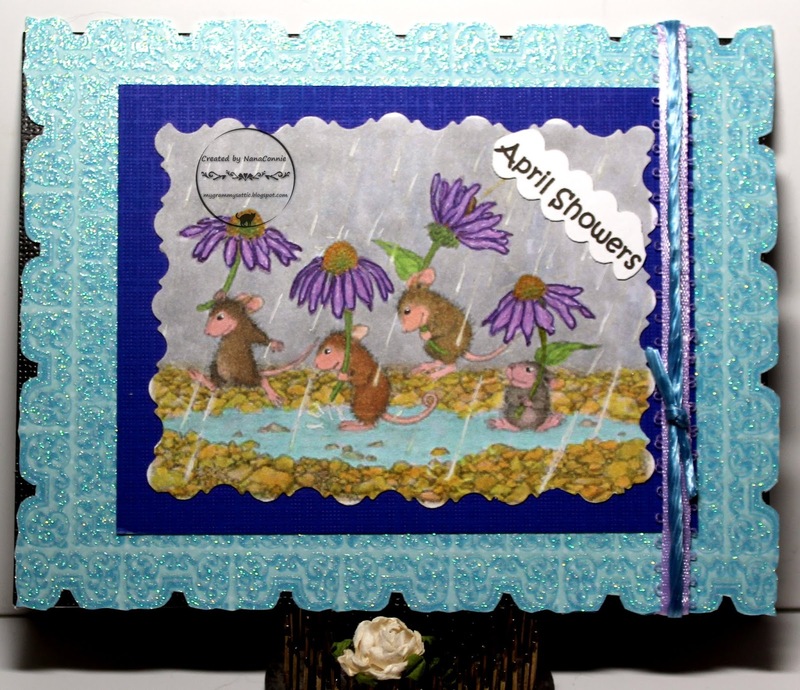 Wonderful April showers and those mousies are wonderful a great card Connie. This is wonderful Connie, love these cute mice. They look like they are enjoying the rain! Wonderful card. Love the frame you created and the beautiful coloring and colors. Thanks for joining the fun at the House Mouse and Friends Monday Challenge and sharing it with us. Lovely to see you playing at House Mouse & Friends! Delightful - that is such a cute card. Thank you very much for coming to play at IKEsWORLD Challenges.